The Jemez Mountain Trail spans desert, canyons, lush forest and more in a region steeped in Spanish and Native American history. Explore cliff dwellings, pueblos, mesas, red rock buttes and waterfalls, leaving time for hiking, cycling, swimming and fishing for a day packed with adventure and memories. The scenic drive starts in the town of White Rock. From Santa Fe, head north on US-285 for 15-miles, and then head west on NM-502. In 11 miles, merge onto NM-4, arriving shortly in White Rock. If you were to continue straight on NM-502, you would reach the birthplace of the Atomic Bomb, Los Alamos. The Los Alamos National Laboratory is not open to visitors but the Bradbury Science Museum (M1) houses historical weapon-research artifacts and acts a bridge to interpret the research and understanding of national security programs. Exhibits also include the Manhattan Project, artifacts and current research on subjects such as the human genome, space science and more. Admission is free. Before departing White Rock, follow Overlook Road to the White Rock Overlook (V1) for incomparable panoramic views of the Rio Grande Valley and the Diablo Canyon from the top of a mesa. Heading west on NM-4, the road winds through the volcanic hills and canyons that form the landscape. You soon arrive at the Bandelier National Monument (H1) where the Anasazi Native Americans built cliff-side dwellings from local volcanic ash. The entrance fee is covered with the America the Beautiful Annual Pass. The Visitor Center features a 14 minute film, exhibits on the history of the area, interpretive programs and hiking options. Explore the archaeological sites with the 1.2 mile Main Loop Trail where you can climb ladders into cavates (small human-carved alcoves). This trail passes Big Kiva, Tyuonyi, Talus House and Long House dwellings. The 2.5 mile Falls Trail descends 700 feet and has spectacular views, dessert vegetation, two waterfalls and ends on the banks of the Rio Grande. Continuing west, the road opens to a view of the Valles Caldera (V2). Once a fiery volcano between 15,000 and 25,000 feet high, Valles eventually collapsed onto itself leaving a caldera spanning more than 175 square miles. A private ranch until 2000, the Valles Caldera National Preserve is now open to the public. There are two fee-free hiking trails off NM-4, The Coyote Call, 3 miles round trip and 2-mile round trip Valle Grande trail. In a few miles, you arrive to a view of the Jemez Falls (H2). Get up close with the 1-mile round trip hike from Jemez Falls Campground. Stop at the overlook or continue to the top of the falls Bring water shoes to wade in the shallow pool at the top. Whichever you decide, this entire area is ripe for a picnic. Climbing up, the road meets the NM-126 in about 6 miles, and this scenic drive heads west on NM-126. Clear in view is the Redondo Peak, technically part of the Valles Caldera’s rim. This part of the drive travels through conifer forest and up to 8,700 feet of elevation, passing several valleys and lakes, including Fenton Lake (W1) popular for camping and fishing and features wheelchair accessible fishing platforms. As you descend, leaving the dense forest behind and returning to drier lands, passing the town of Cuba, the scenic drive continues south on US-550 along the Rio Puerco, a tributary to the Rio Grande. In 40 miles, you arrive in San Ysidro where the NM-4 heads north. In the town of Ponderosa, surrounded by vibrant red rock cliffs, the Walatowa Visitor Center (I1) features exhibits on the history and culture of the Pueblo of Jemez. Explore art, pottery, textiles and more in the Museum Shop. The Pueblo of Jemez is an active village and home to over 3,400 tribal members and is not open to visitors. As you continue north through a stunning red-rock canyon the road climbs to a cliff above the Jemez River. The volcanic past is evident in the hot springs along the river which have been used by humans for thousands of years. 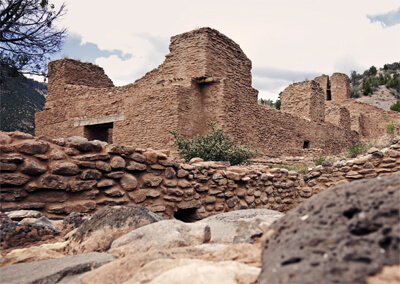 The Jemez State Monument (A2) includes the ruins of a 500-year old Indian pueblo and a Spanish Missionary building from 1622. A visitor center, library, interpretive exhibits, hiking trails, and spectacular scenery make this a worthwhile stop. Next adventure is Soda Dam (V3), a natural dam created by a buildup of calcium deposits in the Jemez River. This fascinating outer-worldly mass of gnarled and twisted rock is 40 feet and growing. Wading is permitted but be careful as water levels change frequently depending on season and rains. Heated from volcanic powers below the area sometimes has a sulfurous odor. As the drive rejoins the junction of NM-126 and NM-4, Battleship Rock (V4) looms tall. The large basalt monolith dominates the view on NM-4. Craggy, sharp peaks surrounded by lush pine forest make for a great hike or a picnic. McCauley Hot Springs and nearby Jemez Waterfalls are a 5.6 mile round trip hike away from the Battleship Rock campsite. Beautiful scenery and relaxing hot springs delight. The path is, however, not well marked. Or just ahead along the road is Spence Hot Springs (H3), a collection of soaking pools in a beautiful setting but can be quite populated due to easy access. It has also been known as a hangout for nudists. The scenic drive comes to an end shortly thereafter. From here, you can return to Santa Fe, head north on the High Road to Taos, or head to Albuquerque via the Turquoise Trail.